A while back we dropped in to visit the NASA Plumbrook and Glenn Research Center (named for the first Ohioan in space). The centers, built to support the Apollo missions, are facilities of jaw-dropping engineering and are still operating after nearly 50 years. One of the centers that caught my fancy was the The Glenn Research Center Microgravity Test Facility, which operates a “zero G” test setup that is used to simulate the effects of on-orbit gravity. How do we squeeze the G out? Well, I’ll get to that in a minute. The work is important because the behavior of liquid, for example, gets squirrely when gravity is removed. Liquid-fueled rockets, used for launch and also for pitch, yaw and roll adjustments rely on proper mixing of propellants and oxidants. One of the effects of zero-G environments is to cause liquids to “clump” together in the center of tanks. This causes the fuel to run away from the plumbing that mixes the ingredients for combustion; nozzles sputter and flame out, which can be a real problem if one is trying to control trajectory, not to mention achieve altitude. 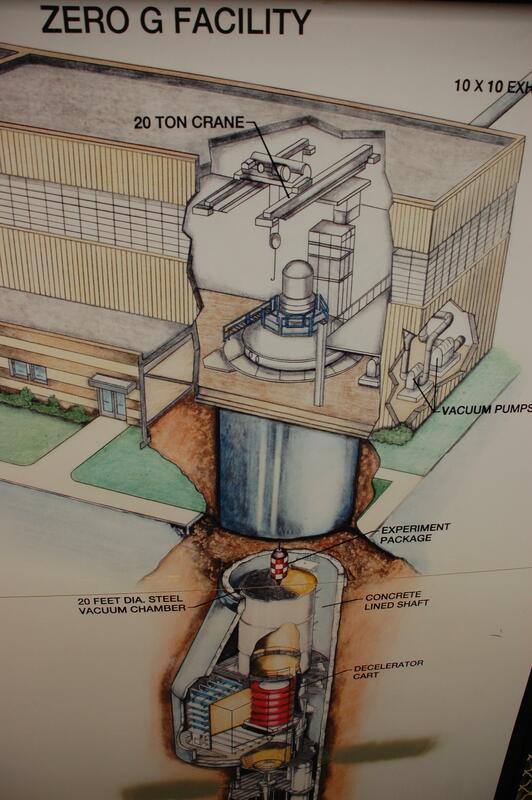 To study this problem, The Glenn Research Center carries out experiments in their drop chamber, a vertical vacuum chamber buried deeply (155 m) into the Ohio ground. For a glorious 5 seconds, experiments can be conducted in a near-weightless environment, with instrumentation carefully crafted to measure behavior during the fall. Evacuation of the chamber is non-trivial as the effect of aerodynamic drag must be minimized to achieve zero-Gs. 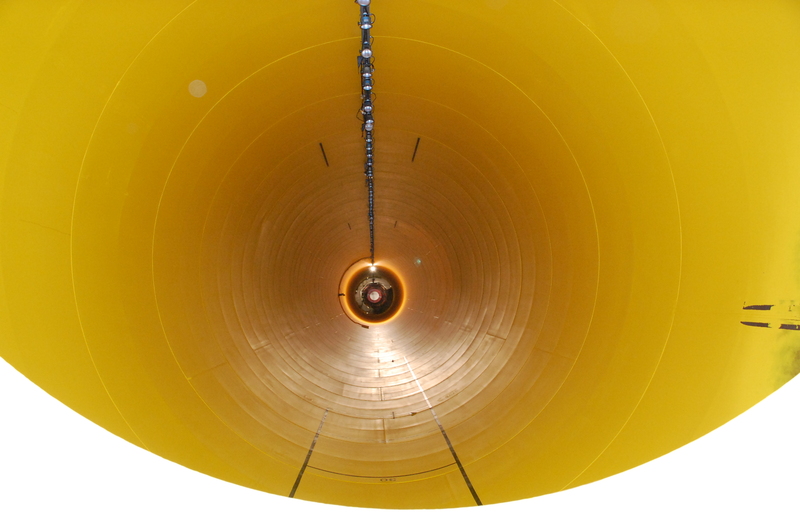 The experiment is fitted in a vehicle (falling pod) that is suspended from the top of the tube, which is a steel-lined concrete vacuum vessel. The big pumps are turned on and the air evacuated. Once the pressure (or lack of same) is reached, the experiment is dropped, accelerating at a rate of 9.8 meters per second per second (“G”), which matches the gravitational constant of Earth. The forces during free-fall create a net zero-G on the experiment and the fun ensues. The fall is ended when the pod splashes into a big bucket of expanded polystyrene that absorbed the energy and brings the pod to a stop. Work at Glenn Research Center may be a precursor to extending zero-G environments, such as can be achieved with parabolic plane trajectories (you can buy your own zero-G experience for about five grand from one vendor I found). Of course, the ultimate big zero-G ride is aboard the International Space Station (cost: if you have to ask…). A cheaper option would be a ticket to Cleveland, and if you’re ever in the area I suggest you drop in.